For half a decade, Aimee walked the routine journey of life—always waiting—always looking to the stars—knowing, hoping, that one day he would return for her. 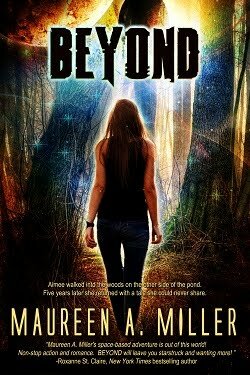 Aimee stared through her hands at the pine needles blanketing the ground below. Beneath her loafers, the packed earth altered, transitioning from brown, to gray, to obsidian−until finally the turf was gone and her leather shoes reformed atop a marble floor. For a moment she was afraid to look up. Only moments ago, she stood in the woods behind her pond as her heart drilled with the fear that he would not come back for her—and yet, the beam had appeared from above. A sign of faith. A sign of love. He was back. He wanted her. She bled happiness at the thought of being with him. Yes, time had passed, but in space the hands of the clock grew fuzzy. Here she was, once again aboard the Guardian Ship, Horus, about to be reunited with the man of her dreams. At last, Aimee lifted her head. With a spontaneous burst of delight at the sight of Vodu’s creased face, she leapt off the pedestal and enveloped him in a fierce hug. "Welcome back, Aimee Patterson." His embrace was strong. His voice deep. Still with a face grooved like a road map, the man was nonetheless ageless. Aimee stepped back to accept the next set of arms that wrapped around her. Raja. Drawn tight into this embrace, Aimee’s fingers lodged into the golden hair spilling down Raja's slim back. She could smell a sweet hint of something floral, and heard emotion deep in the declaration, "Aimee. I'm so glad you're here." Aimee, I'm so glad you're here. Not, Aimee, I missed you. Not, Aimee, I'm so glad you're back. Aimee withdrew and detected a flash of trepidation in Raja's green eyes, but the wide smile did its best to conceal that bantam shadow. As delighted as she was to see Raja, Aimee was already looking over the woman’s shoulder. Save for these two individuals, the transport room was empty. Maybe he was waiting elsewhere. Maybe he was planning a surprise. Her anxiety could not be masked, particularly when the faces staring at her began to lose their mirth. Aimee retreated so that she could look at them both simultaneously. "Where is he?" her voice cracked. Raja clasped her hands together and pressed her lips tight, turning towards Vodu. Maybe age moved at a snail's pace aboard the Horus, but youth was external. The eyes revealed all, and right now the years tallied up inside Vodu's blue gaze. "Aimee, let's go somewhere where we can sit down." On cue, her legs weakened. She reached out and Raja was there, sustaining her with a strong grip. "Where is he?" Aimee repeated, desperation lassoing around her throat. Vodu winced and cast his glance towards the stars outside. "Aimee, Zak−"
"Zak what?" Oh my God. 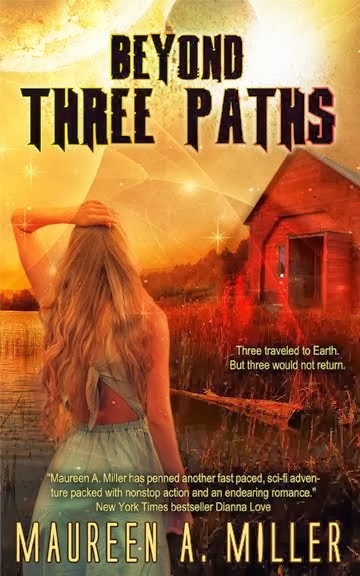 She could feel panic inching up the back of her neck—red hot fingers worming their way up her scalp. 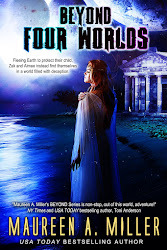 "Not too long after you returned to Earth, Zak left for his planet, Ziratak, as planned." Aimee wasn't even aware that Raja's arm had slipped behind her back for additional support. "He−" Vodu hesitated, "−he missed his rendezvous with the Horus. We lost communication with him." Blood drained from Aimee’s face. She began to feel dizzy, but blinked back the assault. “Zak?” She could manage no more than that single plea. 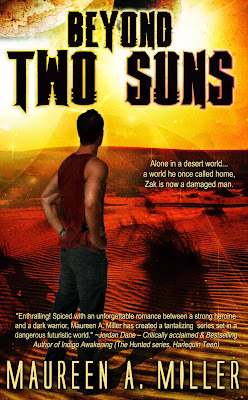 “So if Zak left the Horus shortly after me,” a spark of hope ignited, “then we are getting close. I’ve been gone a full ren.” A ren, she recalled, was a span of five Earth years. He couldn’t say the words, and she sure didn’t want to hear them. Aimee recoiled from the embrace around her back and pivoted to capture the glance that sought to elude her. Yay, it's almost here! 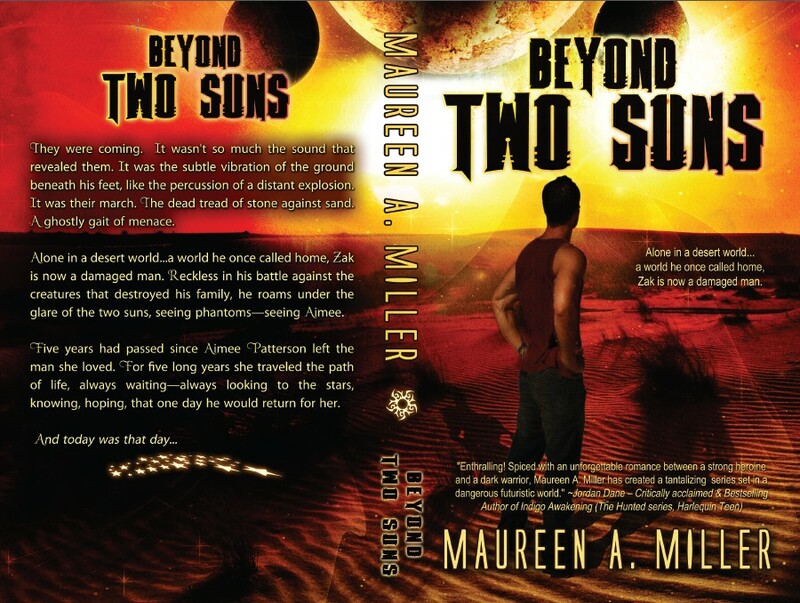 Love the cover art on "Two Suns." My I don't wanna get myself a credit card :(...but I really wanna read Two Suns. why did you have to write such an entaicing story, Maureen? That would make me really happy!!! :) As long as is available for anyone of course (the one on goodreads leaves my country out ¬¬). P.S. I would gladly pay for your book but I seriously don't want a credit card. Ahh, I see now. That's true. The Goodreads giveaway is for print so there is a restriction. But I have some digital giveaways coming up, where there is no restriction. 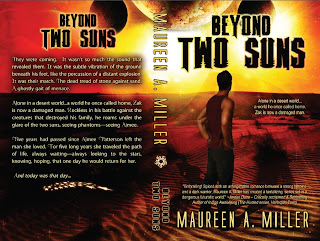 Aw Maureen, if it's possible "Two Suns" is even better than I expected! I read it slower than usual to prolong the enjoyment. I may even reread it. Please tell me #3 is in the works? !